This weekend, the first Gravity Based Foundation for the offshore wind farm Kriegers Flak was installed in Denmark, another milestone in this project. 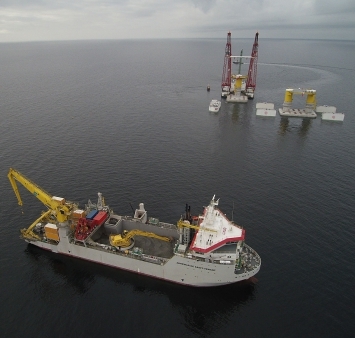 It concerns a 8,000 tonnes GBF which was floated off the semisubmersible barge and towed to the installation location where the heavy lift vessel Rambiz in combination with an in-house designed ballast module set the structure down onto the seabed. The second GBF, weighing 10,000 tonnes, will be installed as soon as possible, depending on the weather conditions. Once the foundations have been installed Jan De Nul's most recent multipurpose vessel Adhémar de Saint-Venant will start with ballasting and scour protection works. Both foundations were constructed on a barge in the Port of Ostend in Belgium. The barge was towed to Denmark on 8 January 2018. Both foundations consist out of a concrete part (GBF) and a steel structure on top. Jan De Nul Group was responsible for the design and construction of the concrete GBF, while Smulders took care of the design and construction of the steel shafts and decks placed on top.